Want to be in with a chance for the Premier League Trophy, or Scottish Professional Football League Premiership Trophy if you are in Scotland, to visit your school? The BBC and Premier League are offering a super incentive to all schools that sign up to the Super Movers newsletter. Sign up here. Each month between January 2019 and May 2019, one lucky school in England and one in Scotland will win a trophy visit and one school will win a runner up prize of Super Movers branded items. More details in the FAQs. 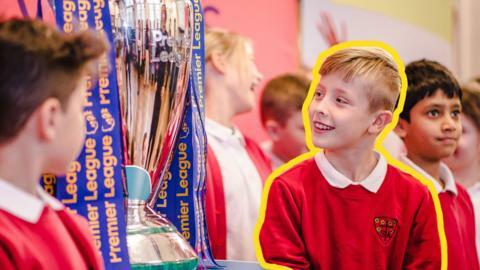 See what happens when the Premier League Trophy visits a school! Congratulations to The Reddings Primary and Nursery School in Hertfordshire, winners of May's Super Movers Prize Draw. The school wins a visit from the Premier League Trophy. Congratulations to Billingborough Primary School in Lincolnshire, winners of April's Super Movers Prize Draw. The school wins a visit from the Premier League Trophy. Congratulations to Heath Fields Primary School in Warwickshire, winners of March's Super Movers Prize Draw. The school wins a visit from the Premier League Trophy. Congratulations to Avening Primary School in Gloucestershire, winners of February's Super Movers Prize Draw. The school wins a visit from the Premier League Trophy. Avening Primary School children showing their best Super Moves. And congratulations to Rosebank Primary School in Dundee, winners of February's Super Movers Prize Draw Scotland. The school wins a visit from the SPFL Trophy. February's Scottish prize winners moving along to a Brain Booster. Second and third prizes were won by Helsby Hillside Primary School, Cheshire; Braithwaite CE Primary School, Cumbria; Marsden Junior School, Yorkshire and Orchard Way Primary School, Surrey. January's prize winning class from Brockwell Junior School showing off their Super Moves. Congratulations to Brockwell Junior School in Derbyshire, winners of January's Super Movers Prize Draw. The school wins a visit from the Premier League Trophy. Second and third prizes were won by Hexthorpe Primary Academy, South Yorkshire; St Michael's Church School, Cambridgeshire; Wordsworth Primary School, Hampshire and Holway Park School, Somerset. Get moving and learning about homophones with Johnny and Inel. Learn about noun phrases with the Rapping Unicorn's song and movement routine.